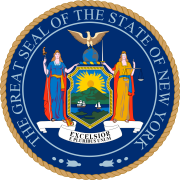 The 2018 United States Senate election in New York took place on November 6, 2018. Incumbent U.S. Senator Kirsten Gillibrand was re-elected to a second full term, defeating Republican Chele Chiavacci Farley. Kirsten Gillibrand ran unopposed in the primary and automatically became the Democratic nominee. The Republican Party has nominated private equity executive Chele Chiavacci Farley. ^ Madina Toure (December 4, 2016). "Gillibrand Wants More Federal Funds to Protect Religious Institutions". Observer. Retrieved February 20, 2018. ^ "Gillibrand accepts nomination for another term, promises to serve all of it". Politico.com. February 16, 2018. Retrieved February 20, 2018. ^ "DR SCOTT NOREN FOR US SENATE - committee overview". Retrieved March 16, 2018. ^ a b c d e "Filings received for the June 26, 2018 Federal Primary Election". NY Board of Elections. April 12, 2018. Retrieved June 26, 2018. ^ Oppenheimer, Jerry (January 22, 2017). "Could Caroline Kennedy be the baggage-free Hillary Clinton?". New York Post. Retrieved January 24, 2017. ^ Bernstein, Jonathan (February 16, 2018). "The 2020 Democratic Primary Is Already Out of Hand". www.bloomberg.com. ^ Jimmy Vielkind (March 2, 2018). "Republicans nominate Chele Farley to make their case against Gillibrand". Politico. Retrieved March 20, 2018. ^ Zremski, Jerry (February 2, 2018). "GOP fundraiser Chele Chiavacci Farley to run against Gillibrand". The Buffalo News. Retrieved February 2, 2018. ^ Hamilton, Matthew (October 1, 2017). "Gibson talks book, Trump". Times Union. Retrieved February 20, 2018. ^ Lovett, Kenneth (January 7, 2018). "George Pataki aide considers run against Sen. Kirsten Gillibrand". New York Daily News. Retrieved January 10, 2018. ^ Schumer, Amy (October 22, 2018). "Newspic.twitter.com/UBe1ZQq5Yz". ^ "EMILY's List Endorses Nine Democratic Women Senators for Re-Election in 2018". EMILY's List. February 10, 2017. Retrieved February 13, 2017. ^ Tiffany Muller (February 13, 2018). "Gillibrand Pledges to Reject Corporate PAC Money; End Citizens United Endorses Re-election". End Citizens United. ^ "Sierra Club #ClimateVoter Guide: Endorsements". Sierra Club Voter Guide. July 16, 2012. ^ "RELEASE: Giffords Endorses Kirsten Gillibrand for Senate in New York". Giffords. August 17, 2018. ^ "New York State AFL-CIO Announces the Endorsement of Senator Kirsten Gillibrand and Endorsements In Congressional Races". New York State AFL-CIO. August 21, 2018. ^ Campaign, Human Rights. "HRC Endorses New York Senator Kirsten Gillibrand for Re-Election". Human Rights Campaign. ^ "New York". Working Families. ^ tbrown (September 6, 2018). "PSC Endorsements 2018". PSC CUNY. ^ "CSEA's 2018 Endorsements". cseany.org. ^ Board, Editorial. "Editorial endorsement: Kirsten Gillibrand for U.S. Senate". syracuse.com. ^ "Newsday endorses Gillibrand for Senate". Newsday. ^ "Endorsement: Gillibrand has right stuff for Senate". Glens Falls Post-Star. ^ Board, Daily News Editorial. "Vote for Gillibrand: New York's junior senator deserves reelection - NY Daily News". nydailynews.com. ^ October 16, The Editorial Board; Pm, 2018 9:01. "amNewYork endorses Kirsten Gillibrand for Senate". am New York. ^ McPherson, Lindsey; McPherson, Lindsey (August 14, 2018). "Trump Touts New York GOP Senate Candidate at Fundraiser for Vulnerable House Republican" – via www.rollcall.com. ^ Lovett, Kenneth (April 9, 2018). "LOVETT: Al D'Amato blasts former pal Kirsten Gillibrand, says she 'doesn't care two s--ts in a bucket' about New Yorkers". New York Daily News. ^ Whalen, Ryan (July 26, 2018). "Rep. Collins Endorses Farley For U.S. Senate". NY State of Politics. ^ "Dan Donovan Endorses Chele Farley for US Senate". Chele Farley for US Senate. May 18, 2018. ^ Reisman, Nick (May 1, 2018). "Faso For Farley". NY State of Politics. ^ Harding, Robert (May 31, 2018). "Rep. John Katko backs Chele Farley in race against Sen. Kirsten Gillibrand". The Citizen. ^ Chele Farley for Senate. "I'm thrilled to announce that Congressman Peter King has endorsed our campaign for US Senate!". Facebook. ^ Pascocello, Dain (July 10, 2018). "Congressman Reed Endorses Farley for U.S. Senate; NY-23 Rep Says Gillibrand 'Out of Touch with Our Values'". NewsLI.com. ^ Harding, Robert (March 28, 2018). "Rep. Elise Stefanik endorses Chele Farley for Senate against Gillibrand". The Citizen. ^ Chele Farley. "Thank you, @claudiatenney, for your endorsement! #Farley4NY". Twitter. ^ "Zeldin Strongly Endorses Chele Farley for US Senate; Calls Successful Businesswoman, Gillibrand Opponent an "Effective Leader, Proven Problem-Solver"". Long Island Exchange. August 28, 2018. ^ "Gov. Mike Huckabee on Twitter". Twitter. Retrieved July 1, 2018. ^ Chele Farley for Senate. "Proud to have the endorsement of Governor George E. Pataki in my bid to represent New York in the US Senate! #Farley4NY #Farley4Senate". Facebook. ^ Chele Farley. "I've been endorsed by America's Mayor! Thank you to @RudyGiuliani for his support at yesterday's #Ohel visit. Let's #PutNYFirst on Tuesday! #Farley4NY". Twitter. ^ Reisman, Nick (June 26, 2018). "Farley Touts Support From Hannity". NY State of Politics. ^ "Crown Heights PAC Endorses". COLlive.com. November 5, 2018. Retrieved November 6, 2018. ^ "Endorsements For New York November 6 General Elections". The Jewish Press. October 24, 2018. ^ "GOP moderate Farley is better for New York than 'poser' Gillibrand". New York Post. October 27, 2018. Retrieved October 28, 2018. This page was last edited on 6 March 2019, at 18:16 (UTC).